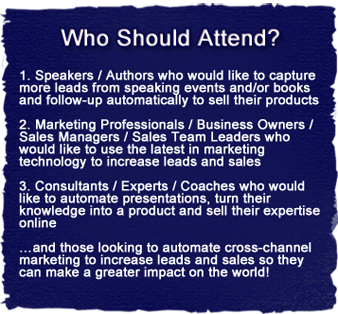 Ready to revolutionize your business? It’s time to reach more, earn more and make a greater impact on the world! Do you have all the business you need? Are you and your business doing everything you possibly can to generate as many leads as possible, follow-up with those leads most effectively and convert those leads into sales (and do so while you sleep)? If not, now you can. We’d like to invite you to a very special course that covers the 7 steps to revolutionize your business. In the course, we share the 7 ways your company is losing sales. In every case when we’ve met with companies, we’ve found they are not doing some or all of the 7 items and are thus losing sales. Then, when you do these 7 steps, you can revolutionize your business. In these 7 steps, we show how to capture leads 7 different ways, communicate with the leads across multiple channels and convert those leads to sales… all on autopilot while you are sleeping or spending time with loved ones. We show the strategies that are working best today for companies that are utilizing the latest cutting-edge technology. We’ll cover real case studies of businesses just like yours who have implemented these strategies and exploded their growth … and show you how you can do it do too. How a company went from capturing about 80 leads at their events to capturing 1,400 and having that lead to over $14 million in sales. How sales managers and direct sales team leaders enable their sales reps to follow-up automatically before they have even left networking events or the trade show floor. Plus we’ll share a special bonus on how we went from a book idea to a #1 Best Seller in only 10 days and how you can do it too. Simply enter your contact information in the box to the upper right of this page to join us for this invaluable training.